Whether from a cold, flu, animals or plants, this formula will quickly clear your sinuses and ensure free breathing. These herbs have been shown to be very effective in research studies. Blocked sinuses can cause difficulty breathing. Sinus clear is a safe effective natural product for sinus congestion, lingering colds, seasonal allergies. Sinuses cleared and Headache gone, you’re back to life with gusto! Non-drowsy, natural, drug-free herbal formula promotes nasal and sinus health using 11 natural herbs in a sinus relief pill formulua. Works Fast!! Non-addictive natural herbal decongestant. No artificial flavors, no artificial colors, no gluten, no dairy. Natural, period. A great sinus infection relief formula! 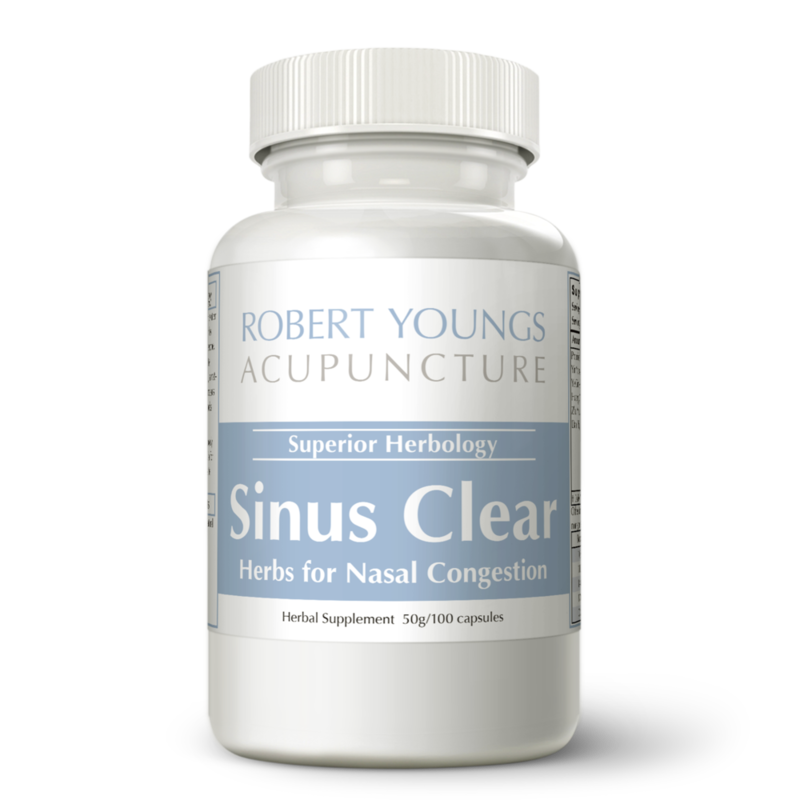 "Sinus Clear" can work as quickly as 60 -90 minutes with effects lasting for hours. If no effect is felt in 1.5 hours, increase dose to next body weight. Herbs are so much better than the artificial ingredients in most over the counter products! Natural and plant based, herbs work best when taken 3 times a day and in larger doses. Herbs for Sinus Clearing are most effective when taken in 3-4 doses per day with dose size adjusted by personal response. Dose may be increased for a quicker and stronger response as needed. Dosage based on body weight..
Cang Er Zi (Fructus Xanthii) is commonly used in traditional Chinese medicine to open nasal passages and alleviate pain. Warm and acrid in nature, this natural herb can treat sinusitis, rhinitis, sinus headaches, nasal blockage, turbid nasal discharge or loss of smell. Cang Er Zi can also be used to dispel pain and dampness and relieve muscle pain. Xin Yi Hua (Flos Magnoliae) has similar properties with Car Er Zi (Fructus Xanthii) and is used to treat nasal obstruction due to wind-cold syndrome. Mild in function, Xin Yi Hua is most effective for opening nasal obstruction and draining nasal discharge caused by wind-cold. A commonly used Chinese herb, Jie Geng (Radix Platycodonis) is primarily used to soothe the Lung and dispel phlegm. Acrid, bitter and dispersing in nature, Jie Geng ventilates the Lung and relieves phlegm caused by wind-heat or wind-cold invasions. A Jie Gen formula can treat numerous conditions, including cough, fever, thirst, stuffy nose, headaches or febrile disorder. Considered one of the strongest herbs to dispel phlegm and pus, Jie Gen can also be used to treat lung abscesses manifested through cough with blood and pus and thick, yellow sputum. Lian Qiao (Fructus Forsythiae) is an ornamental plant with incredible health properties. Covering the channels of Lung, Heart and Gallbladder, Lian Qiao is primarily used to clear heat and eliminate toxins. This cold and bitter herb has dispelling and dispersing properties to clear heat and treat early-stage febrile disorders. Lian Qiao can also be used to treat heat attacking the Heart and alleviate symptoms like irritability, delirium and fever. Bai Zhi (Radix Angelicae Dahuricae), is commonly used to remove dampness, expel cold and stop pain. This acrid and warm herb goes to the Lung, Spleen and Stomach channels, and is a great way to dispel cold and relieve pain. Its main functions are to treat headache, muscle aches, sinus congestion and to reduce swelling. It is also used as a remedy for prolonged diarrhea caused by excessive damp. Wu Wi Zi’s main property is the ability to secure the fluid which is lost from sweating or urine, raising the Yang Qi and helping it circulate though the body. Since night sweats usually occur due to a Ying and Jing deficiency, Wu Wei Zi balances these two energies in the body, reducing excessive loss of body fluids. Another important property of Wu Wei Zi is calming the Shen (spirit) and tranquilizing the heart. This powerful herb has sedative properties and can treat Yin and blood deficiency. Symptoms such as palpitations, anxiety or insomnia can be improved with a Wu Wei Zi formula. According to traditional Chinese medicine, excess heat in the Lung and Stomach channels can manifest in symptoms like high fever, perspiration and thirst with desire for cold drinks. Bitter and sweet in taste and cold in nature, Zhi Mu (Radix Anemarrhenae) can both sedate Lung and Stomach fire and moisten dryness. Zhi Mu can also clear Lung heat and nourish Lung yin to remove dryness and relieve dry cough. Bitter and acrid in taste and cool in nature, Ye Ju Hua has is commonly used to clear heat and remove toxicity. Due to its strong heat clearing properties, Ye Ju Hua is used to treat furuncles and abscess due to heat-toxicity. It is also effective in treating sore throat and red eyes. Sweet, acrid and slightly warm, Fang Feng (Radix Saposhnikoviae) is one of the most effective herbs in the cold and flu releaser formula. Covering four channels, Fang Feng’s main functions are dispelling wind, cold and dampness and relieving body aches and muscle pain. Because Fang Feng’s dispelling properties are stronger than other herbs, it can be used for both wind-cold and wind-heat disorders. Fang Feng can fight muscle spasms and cramps by dispelling wind from the Liver channel. It is commonly used to treat conditions such tetanus, glottal spasms and trembling of the hands and feet. Jing Jie (Herba Schizonepetae), also known as Japanese catnip, is a medicinal herb primarily used to treat the common cold. Slightly warm and mild in action, Jing Jie has fewer secondary effects than other herbs, since it treats and ends the symptoms of the cold in a natural way. Combined with other herbs, Jing Jie can effectively treat symptoms such as chill, fever, stuffy nose, headache, body ache, runny nose, coughing and phlegm.